Since the windows 10 anniversary update, Microsoft have tried to introduce more features to the windows 10 OS. Such as better customizable app centre, better battery option, improved lock screen, redesigned start menu, Microsoft Ink, extension support for the edge browser among many others. But the area that actually got more of the update is arguably the Cortana. New updates on the Cortana includes new notification features, easy interaction between your PC and Android or Windows Mobile and one of the major update which we are going to talking about is the new Cortana integration into other windows 10 apps. Cortana has now been integrated on the edge browser with a new feature which works exclusively on YouTube. 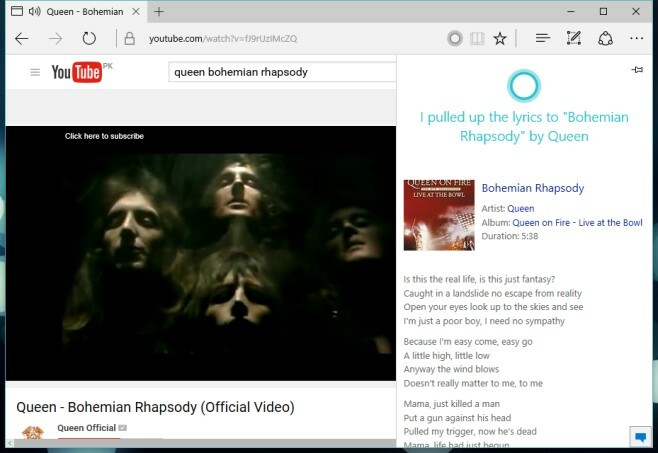 Now Cortana can easily help you get the lyrics of any music video you are playing on YouTube and the better part of it is that you even can pin the lyrics beside the YouTube music video you are watching. ==> Launch your Edge browser. ==> Open YouTube and play the music video you need the lyrics for. ==> At the right side of your URL bar, click on the ring icon that represents Cortana. ==> A panel will appear at the right hand side of the screen displaying the lyrics of the current music video you are watching. ==> Click on the little pin icon at the top right corner so that the panel won't close when yoi click outside of it. It's as simple as that. Now you can sing along to your favourite music without the need for any third party app. That is a cool music band. I think that I would like to get more materials on their art projects. It should be nice.